April has come with lasts and firsts. I had a bittersweet last bike commute to work – no I’m not giving up biking – but I am leaving the world of full-time work. So, okay, it wasn’t too bitter – and nothing will prevent me from cycling into DC whenever I feel like it. But I guess I felt a bit sad to be shedding the identity of “bicycle commuter.” Instead, I’ll adopt the role of “transportation cyclist” – especially since I’ll have more time for daily errands. The last day I’d biked into work I had a dental appointment in Chevy Chase. I took the bike there on the Metro and then got to ride the Capitol Crescent Trail home. 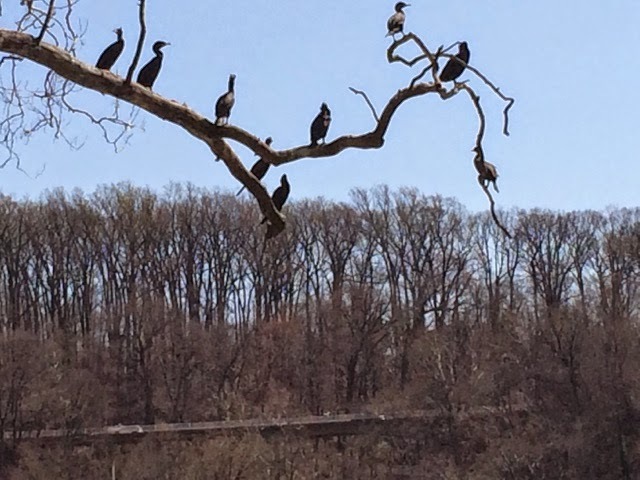 Along the Potomac I saw a large group of double-crested cormorants resting in a tree. April 8-11 I headed to Minneapolis for the AWP writers conference. The weather looked gloomy the first couple days – rain mixed with, yes, SNOW! But my third day was sunny and crisp so I took a mid-day hiatus from the huge convention center event, found a bike share, and went for a brisk half-hour ride around the neighborhood. 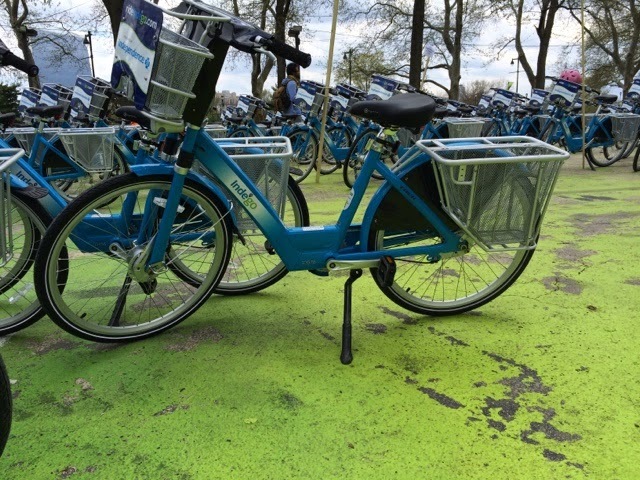 The Minneapolis bike share is called “Nice Ride” – owing to the state’s reputation for “nice.” Having just cycled in Chicago a couple weeks earlier, I can say there was a huge difference between Chicago and Minneapolis drivers. In Minneapolis there were few bike lanes near the convention center, but drivers consistently gave me a wide berth and offered the right-of-way at intersections. By contrast, in Chicago the culture seemed to be more like: let’s see how close I can drive to the bike…mwahahahaha. I returned to DC with spring in full bloom and enjoyed learning some new bike routes – riding to Dupont Circle to drop off my Master’s Thesis – yay, almost done with my writing degree – and then returning via the Rock Creek Trail – which I haven’t ridden for years. 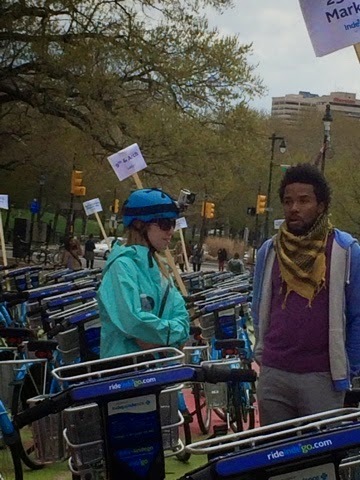 This week I came up to Philly and was excited to see the kick-off of the Philly bike share system, called Indego. 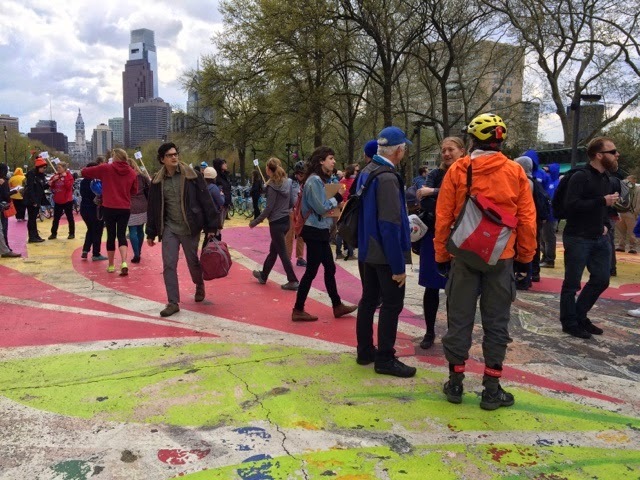 Two hundred fifty of the bikes were arrayed by the Philadelphia Art Museum and people had signed up to take them to docking stations around the city. Unfortunately I didn’t hear about the event until the day before. Apparently they advertised it Friday and all the bikes were eagerly spoken for. The crowd was diverse: young and old, black and white, business attire and bike gear. There were folks with bike cams on their helmets and a general air of festivity. 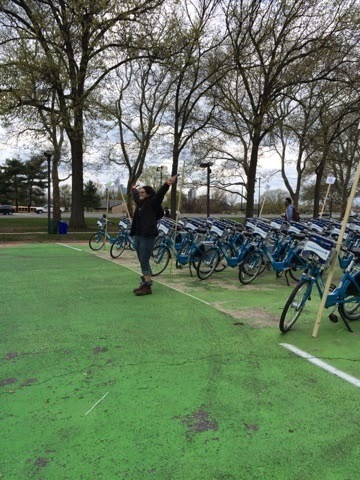 I have now ridden bike share bikes in DC, Boston, New York, San Francisco, Chicago, and Minneapolis. Aside from differences in color and sponsorship, all the bikes seemed to be the same general design, with the exception of the San Francisco bikes having seven (as opposed to three) gears – for the obvious reason. The Philly bikes are different. They have a front and rear basket, and a rear rack, as well. One of the Indego staffers told me that they did extensive focus groups and people wanted more storage space. Also different is the pricing structure in Philly. While prices for a 24-hour rental ranged from about $6 in Minneapolis to nearly $10 in New York, the Philly system has monthly and per-ride prices – no annual membership or daily rate. A single ride is $4 and can be paid with cash or credit card – an attempt to help people who don’t have credit cards be able to use the bikes. Riders can pay a $10 annual fee to get unlimited trips of $4 for an hour or pay $15 per month for unlimited free rides. While this comes out to considerably higher than DC’s annual membership fee of $75, Philly has colder winters and many riders may prefer to pay only for the months they expect to ride. My small accomplishment was making my way into town from the Cycling Yogi’s Mount Airy home by myself. I always followed my Sherpa and, even though I’d done the trip many times over the past five years, I was a bit nervous about trying it on my own – due to my notoriously bad sense of direction. 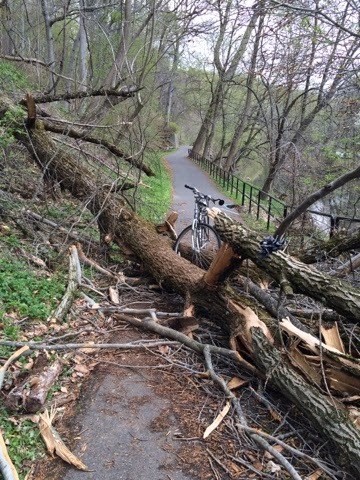 Well, to be honest, my cycling Sherpa guided me to the beginning of the Wissahickon Trail and it was smooth sailing from there – with the exception of one downed tree covering the path. I’m lucky to be starting my new phase of life in the spring, when the weather is mild and the blossoms abundant. I’m looking forward to trying new routes with plenty of time for detours and the serendipitous adventures that accompany getting lost.